For the record, this ex-president is not a fan of racism. After refraining from criticizing his successors for eight years, on Tuesday former president George W. Bush revealed in a Today interview that he takes issue with President Trump’s attacks on the press and the travel ban. He even said, “We all need answers” on the president’s potential ties to Russia. Then in an interview with People published on Tuesday night, Bush added that he’s not a fan of the “racism” and “name-calling” he’s seeing today. “I’m optimistic about where we’ll end up. I mean, yes, I don’t like the racism and I don’t like the name-calling and I don’t like the people feeling alienated. 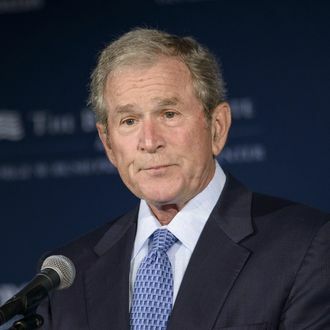 Nobody likes that,” said Bush, who is promoting a book featuring his portraits of wounded veterans. Some on Twitter interpreted this as a direct attack on Trump, and if a former president were accusing the White House’s current occupant of fomenting racism that would be pretty incredible. However, upon closer inspection, Bush didn’t go that far. The accompanying video doesn’t show the question Bush was responding to, but the former president’s spokesman, Freddy Ford, tweeted an excerpt from the transcript. While some have argued that Trump is at least partially to blame for the recent rise in hate crimes, in context it doesn’t appear that’s what Bush meant to say in his comments — though the remark still isn’t a ringing endorsement of President Trump’s leadership skills.